A $1M practice, for instance, might spend $100K a year. If they get 40 new patients per month, and roughly half come from external marketing, then 240 patients per year for $100k means it costs around $416 for one patient. You only get one chance to make a good first impression. If you don’t make a good first impression on a new patient, it’s like burning hundred dollar bills (4.16 of them to be precise). So what is a good first impression? Everyone knows you should smile at a new patient as they walk in the door and welcome them by name. What can happen instead? Despite their best intentions, a team member can only do one thing at a time. The new patient could enter as the phone rings, and another patient walks out of the treatment room. Your precious new patient can feel ignored. Psychologically, nervous people are always looking for reasons to validate their fears, and so these people can get upset over almost anything. Sadly, this scenario is not the exception. Murphy’s Law is the norm, and we are putting an unreasonable demand on our teams if we expect them to handle every patient perfectly. The consequences of mishandling a single patient are significant. Apart from losing the $416 acquisition cost, AND the thousands in opportunity cost that the patient’s potential treatment might have contributed, there is the risk that they will post a negative review. A single negative review can crush your new patient numbers. Everything that happens after the patient arrives at your office falls into the realm of Internal Marketing. This is where smart practice operators really shine. They've realized the importance of plugging the leaks - of keeping all the patients that they’ve paid for. Plugging leaks can easily double a practice’s income, and the costs are tiny. The objective is to assuage fears, relax the patient and build friendly relationships ASAP, so that each of these patients become lifelong fans. Over the years, I have looked for ways to mitigate these common challenges, and that has led me to create a new tool that I believe is a game changer. It’s called Channel D. They are silent videos for your reception room that bear no resemblance whatsoever to any product out there. Consider it as a pre-emptive communications tool, designed to build trust, familiarize the patient with you and your team, and to trigger conversations about various clinical conditions. 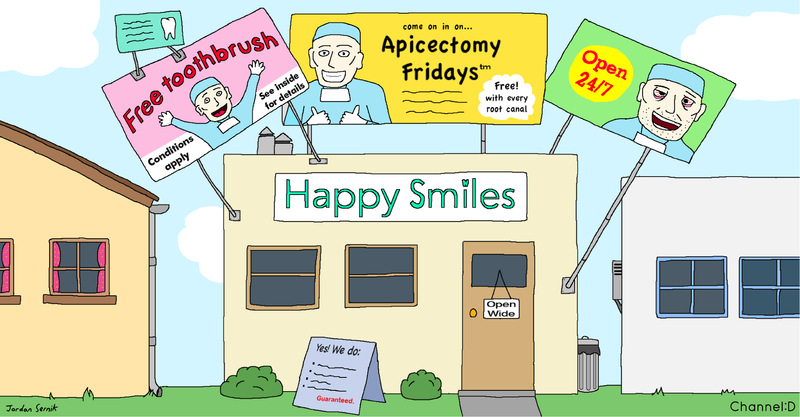 Using humor, clever scripting, bright colors and graphic surprises, the viewer (patient) will often walk into the operatory with a smile and give you a compliment. This is because many videos feature photos of you and your team and patients view them as your unique creations. We are able to shape emotions and lighten the mood. They also know a lot more about the key treatments that you provide, so you’ll enter into relevant conversations that will often lead to better treatment choices. If the team member does have a moment to engage with the patient, it will be a much friendlier conversation, and it will usually be about the treatments you provide. The team member can pass on the details of the discussion to the clinician. It’s hard to put a definitive value on starting out on the right foot; of building rapid relationships and having the patient initiate questions about treatment. We know, however, that it’s very valuable. It’s equally impossible to know the exact ROI of external marketing, but we do know that dentists spend hundreds of dollars essentially paying for just one new patient. Compared to the high costs of external marketing, the cost of internal marketing, including Channel D is minuscule. The cost of ignoring these issues is enormous.